GateCiti® Studio offers the best and most innovative product in the industry of wrought iron and stainless steel works to compliment and beautiful your environment. 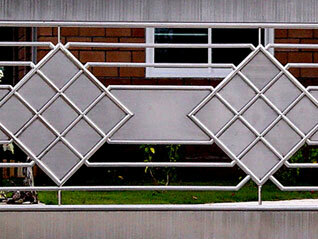 We provide unique custom and professional gate designs to meet client requirements. Our mission is to supply quality coupled with timely delivery. 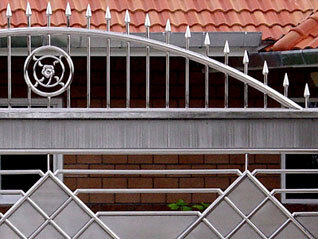 GateCiti® is primarily engaged in custom stainless steel works to provide professional advices, techniques and technology for the layout, planning, design of wrought iron and stainless steel gates and fence. In metallurgy, stainless steel is defined as a steel alloy with a minimum of 10% chromium content by mass. Stainless steel does not stain, corrode or rust as easily as ordinary steel (it "stains less"), but it is not stain-proof. It is also called corrosion resistant steel when the alloy type and grade are not detailed, particularly in the aviation industry. There are different grades and surface finishes of stainless steel to suit the environment to which the material will be subjected in its lifetime. Common uses of stainless steel are cutlery and watch straps. Stainless steel differs from carbon steel by amount of chromium present. Carbon steel rusts when exposed to air and moisture. This iron oxide film is active and accelerates corrosion by forming more iron oxide. Stainless steels have sufficient amount of chromium present so that a passive film of chromium oxide forms which prevents corrosion. High oxidation-resistance in air at ambient temperature are normally achieved with additions of a minimum of 13% (by weight) chromium, and up to 26% is used for harsh environments. The chromium forms a passivation layer of chromium oxide (Cr2O3) when exposed to oxygen. The layer is too thin to be visible, and the metal remains lustrous. It is impervious to water and air, protecting the metal beneath. Also, this layer quickly reforms when the surface is scratched. This phenomenon is called passivation and is seen in other metals, such as aluminum and titanium. When stainless steel parts such as nuts and bolts are forced together, the oxide layer can be scraped off causing the parts to weld together. When disassembled, the welded material may be torn and pitted, an effect that is known as galling. This destructive galling can be best avoided by the use of dissimilar materials, e.g. bronze to stainless steel, or even different types of stainless steels, when metal-to-metal wear is a concern. In addition, Nitronic alloys reduce the tendency to gall through selective alloying with manganese and nitrogen. Passivation is the process of making a material "passive" in relation to another material prior to using the materials together. For example, prior to storing hydrogen peroxide in an aluminium container, the container can be passivated by rinsing it with a dilute solution of nitric acid and peroxide alternating with deionized water. The nitric acid and peroxide oxidizes and dissolves any impurities on the inner surface of the container, and the deionized water rinses away the acid and oxidized impurities. Another typical passivation process of cleaning stainless steel tanks involves cleaning with sodium hydroxide and citric acid followed by nitric acid (up to 20% at 120F) and a complete water rinse. This process will restore the film, remove metal particles, dirt, and welding generated compounds (e.g. oxides). In the context of corrosion, passivation is the spontaneous formation of a hard non-reactive surface film that inhibits further corrosion. This layer is usually an oxide or nitride that is a few atoms thick.